As mobile continues to proliferate itself throughout your dealership and your customers lives it’s not a bad idea to take a step back and assess how mobile can have a real impact on your bottom line of business. Your mobile strategy through marketing, social media, service and other areas of your dealership are vital to success. But what every dealer wants to know is how do we sell more bikes. Have you asked your sales manager and sales team how important mobile is to their ability to sell? You know your web traffic is mobile, your social media traffic is mobile, you send text alerts, etc… because your customers demand quick and easy access to your dealership. Now you need to use all that data to improve your sales funnel and better prepare your sales staff. Lead generation is a critical part of the sales cycle. In most cases this is where a customer begins the process towards purchase. As you implement mobile pieces to that process you must consider how to integrate your sales team early on and not wait until the customer is ready to buy. Mobile can do a fantastic job connecting that initial interest from a prospective buyer to a well-equipped sales person. A great example of this is recently a dealership positioned a motorcycle at a remote location unattended. Positioned with that motorcycle was a digital tablet on a stand offering customers an opportunity to find out more information by simply entering their phone number. Once the customer entered their mobile number a text was sent to them with a link to a full details page of that bike. Now the customer can get the full specs of the bike as the dealership continues to provide information as the customer desires. An additional trailing text is then sent offering the customer an opportunity to test ride the bike and gives the phone number of the dealership sales department to call and set up an appointment. At this point the dealership knows which bike the customer is interested in, where they saw this bike, the customer's mobile number and if the customer was interested enough to click the link and view the full bike description. Now if all this qualified information makes it’s way to a sales person it gives them a real advantage on taking care of that customer before they ever walk in the dealership. Another opportunity for bike sales can be through your text club. Many dealers are limited on what they can advertise on NEW bikes based on the manufacturers restrictions. So dealerships choose to feature used inventory to intrigue customers that may be looking to purchase up or down depending on their needs. 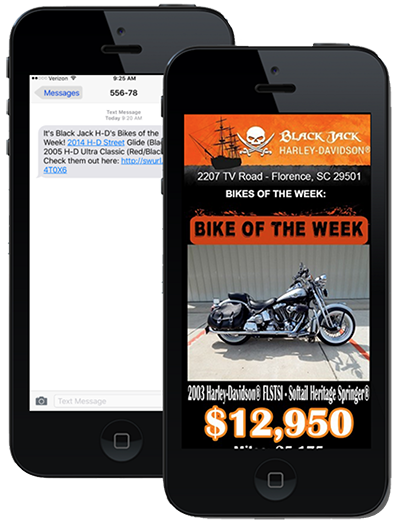 Creating a mobile page with 2-4 “Featured Used Bikes” each week, then sending a text with a link to those bikes is a great way to get inventory in front of a large group of customers in a single instance. Tracking the customer's path through receiving the text, to which bike they click through to view can give your sales staff an immediate opportunity to follow up with that customer. With a good mobile platform your customers can even reply to the text alert asking questions about the featured bike/s and you must get those to your sales manager or sales staff immediately so the customer can be served without delay. Through the mobile platform a sales person can correspond with the potential buyer via text. This could make the difference in a sale or the customer impatiently shopping elsewhere while they wait. Hearing from numerous dealerships they SOLD a bike from a single text alert is not as surprising as it once was a few short years ago. Dealers utilizing the right mobile vendor and platform have come to expect this kind of success. The mobile strategy for sales doesn’t end once the purchase is made. The dealership’s mobile platform should also include the capability for sales staff to manage and continue ongoing communication with their customers. A salesperson should send personal text alerts following up the sale, offering additional goods and services and letting the customer know they still have a singular connection with your dealership. The reason this should be done inside the mobile platform is so the sales manager can have oversight and assist with their entire sales staff and how they communicate with customers. If a sales person uses their personal phone to do this it can’s be as efficient and many things can fall through the cracks. Using the mobile platform to it’s fullest potential can be so important in grooming each and every customer fora long-term sales strategy and relationship. Finally, any advertising or marketing done on mobile channels like google, social media, etc… must have a very carefully crafted path to sales. If you feature inventory for purchase it’s imperative you include your sales staff as early in the process as possible so they can assist the customer the very minute the customer needs help. Dedicate a sales person once a week to answer customer questions via text about new bikes or recent used inventory you’ve received. Your sales staff are the experts and represent your dealership so it goes without saying they should be given every tool possible to let your customers know they are prepared for all their needs.